This route is located north of Khao Yai national park, in Pak Chong area near the park entrance, and cross different landscape as orchards, forest and villages. This is a very easy river, more for beginners than rafting lovers .The difficulty level is at 1-2, good for rafting novices. This river is not open outside of rainy season, the best time to come is during May-September for higher water level. 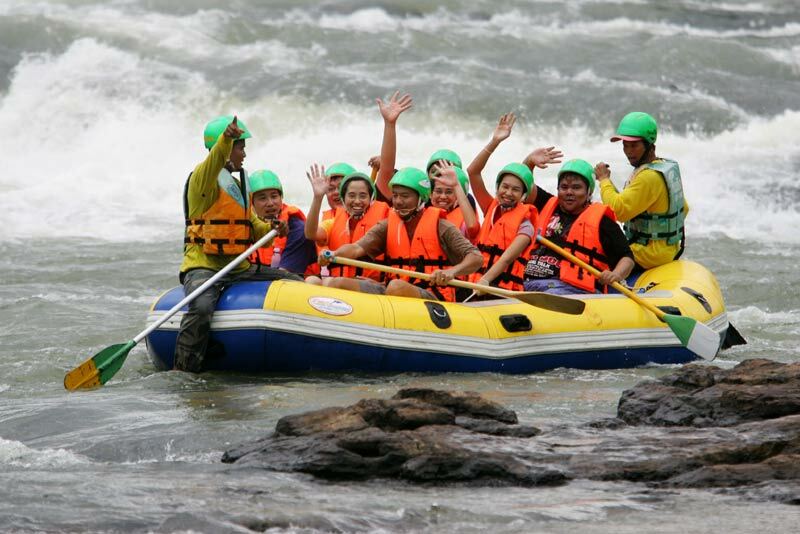 Each rafting trip takes about 2 hours and tourists can add to their enjoyment by taking an elephant ride afterwards threw the same operator. For more information: Contact Pang Chang Khao Yai (The Jungle house resort, operating rafting and elephant trekking in the nearby jungle) on Thanarat Road Km. 19.5, 215 Moo 5 Thanarat Roed Km.19.5 Pakchong. tel. 0 4429 7183. Gallery | This entry was posted in Activities Khao Yai, Khao Yai National Park, Pak Chong Tourism, Pak Chong Travel Guide, Rafting in Khao Yai, Sports in Khao Yai and tagged Lam Takhong river, Rafting, River Rafting. Bookmark the permalink.